I don’t recommend many books on this blog. Mostly that’s because I want those I do recommend to stand above the rest as truly fantastic. Russell Moore’s Tempted and Tried is just such a book. It is a difficult task to write with eloquence and verve about theological and biblical truths, but when an author succeeds a powerful work is created. Moore succeeds. Tempted and Tried is one of the most significant books I have read in the past couple years. By that I mean that it is extraordinarily well-written and extraordinarily poignant in its communication of truth, and thus it is extraordinarily impactful. 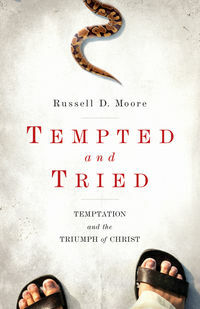 In the book, Moore takes the reader to a biblical understanding of temptation. He explores Jesus’s temptation in the wilderness, it’s depths, and the significance for the believer of having a savior who rightly responded to temptation. But Moore, as he is so gifted at doing, doesn’t just give the Sunday school version of the story and emphasize Jesus’ quotation of scripture as “the right way to respond”. Instead he explores the heart and the psyche that make temptations so powerful and Jesus’s response so meaningful. It is a theologically weighty book without the distractions or obstacles of pretension and academic vocabulary. It is a personal book without being unduly psycho-babbly or emphasizing felt needs to a fault. No, it is a book that uses clear, biblical truth to help the reader feel what needs to be felt and understand what needs to be understood. This book is deeply hopeful and rooted in the gospel. It blessed me enormously and I cannot recommend it highly enough. The last two chapters are worth the price of the whole book, and the rest is A+ too.